Jury led by Jeremy Thomas awards Terence Davies title with top award. The 43rd annual Film Festival Ghent (Oct 11-21) awarded Terence Davies’ A Quiet Passion with the Grand Prix for Best Film. Shot largely at AED Studios in Antwerp, the Emily Dickinson biopic is a UK-Belgium co-production. The international jury was led by Jeremy Thomas. The veteran UK producer was also recognised by the festival for his contribution to cinema, receiving the lifetime achievement award. Ahead of the closing-night screening of Belgian film-maker Bavo Defurne’s romantic drama Souvenir, Thomas and his jury – including Vietnamese director Tran Anh Hung, author Jonathan Coe and actresses Maaike Neuville, Lina El Arabi and India Hair – handed out the prizes. Davies’ A Quiet Passion win came with $47.500 (€43,500) in prize money; special mention went to Kristina Grozeva and Petar Valchanov’s Glory. The Georges Delerue Award for best score went to US producer/composer Johnny Jewel for Fien Troch’s Home, which world premiered in Venice. Jewel received $23,400 (€21,500) in prize money. “We have received some of the most artistically ambitious films from the last five decades from Mr. Thomas,” said Ghent artistic director Patrick Duynslaegher, who presented Thomas with his award. 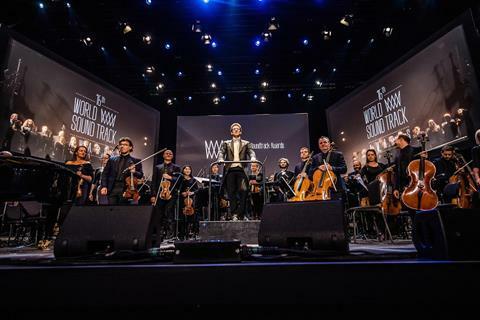 The festival also played host to the 16th annual World Soundtrack Awards (WSA), with composers Carter Burwell, Joe Kraemer and Jeff Beal recognised with awards. Burwell swept the major categories including composer of the year for his work on Carol and Anomalisa, the public choice award and best original song written directly for a film – ‘None Of Them Are You’ from Anomalisa. The film’s writer-director Charlie Kaufman shared the music and lyrics credit. The New York-based Burwell, who was Oscar nominated this year for Todd Haynes’ Carol, accepted his awards via video link (clad in a tuxedo) due to his current commitments on Haynes’ Wonderstruck, starring Michelle Williams and Julianne Moore. Burwell beat out Ennio Morricone (The Hateful Eight), Thomas Newman (Bridge Of Spies), Daniel Pemberton (Steve Jobs) and John Williams (Star Wars: The Force Awakens) for the composer of the year accolade. Kraemer won discovery of the year for his work on Mission Impossible: Rogue Nation, while Neal won the inaugural TV composer of the year for his work on Netflix series House Of Cards. Other awards included best original score for a Belgian production, which went to Hans Helewaut for Cafard, and the Sabam Award for best young international composer, which went to Switzerland-based Sándor Török. Renowned for his groundbreaking electronic scores for the likes of Merry Christmas, Mr. Lawrence, The Last Emperor and, more recently, Alejandro Gonzalez Inarritu’s The Revenant, Ryuichi Sakamoto was honoured with the WSA’s lifetime achievement award. The Japanese composer’s musical partner Alva Noto presented the award, citing Sakamoto’s film work as music that was engraved in people’s memories and would inspire generations to come. Following a lengthy standing ovation, Sakamoto accepted the honour and said: “As I looked over the list of people who have previously received this award, I was bewildered. I don’t specialise in films. Conductor Dirk Brosse led the Brussels Philharmonic and Flemish Radio Choir in an orchestral and video presentation of the composer’s scores for The Last Emperor, Pedro Almodovar’s High Heels, Brian De Palma’s Femme Fatale and his Bafta-winning score to Merry Christmas, Mr. Lawrence, which Sakamoto accompanied on piano.